New Weather Service Launched that is Compatible with Windows Vista™ – Weathernews Inc.
Tokyo, January 30, 2007—Weathernews Inc. (Location: Minato-ku, Tokyo; President: Chihito Kusabiraki), the world’s largest publicly-traded weather information provider with business bases in 16 countries,will offer users a service compatible with Microsoft Windows Vista™ beginning on January 30. In addition to providing weather content created using the “MCML(*1)” of Windows Media Center (a standard feature of Windows Vista), Weathernews has also begun offering new content at its corporate website that makes use of “WPF(*2).” By always striving to take advantage of the latest technology, Weathernews is able to provide its users with services that are more convenient and user-friendly. Windows Vista’s WindowsMediaCenter allows users to easily enjoy digital entertainment on their PC or television through the use of a mouse, remote control or similar device. Media Online, one of the features of WindowsMediaCenter, lets users access and view a variety of content online, such as news, music, movies, and entertainment; and Weathernews is now making use of Media Online to provide its weather content service. Weathernews weather content is made up of four channels: 7-day weather forecast, radar imagery, cloud imagery, and 5-minute weather forecast. The 7-day weather forecast providesweather information for 11 major cities that includes weather forecasts, high and lowtemperatures, together with comments by meteorologists.The 5-minute weather forecast program is a video program in which a weathercaster explains current weather trends, the national forecast, and provides other easy-to-understand information. The radar imagery channel displays precipitation intensity for the nation according to region, while cloud imagery offers users such features as the ability to track the hourly movement of clouds via animated graphics. No matter how detailed the weather information sought, users can find it on one of Weathernews’ channels. And in addition to these four channels, Weathernews has plans to gradually build and expand a channel providing weather information that is more closely tied to users’ daily lives. Currently, the Weathernews corporate website allows users to view an animated map displaying cloud movement over the past six hours. Users can also view the world’s climate, both daytime and nighttime, according to region. The corporate website has made it possible to now view the traditional flat weather map as a 3D globe which users can manipulate freely on their computer screens using a mouse, spinning it and zooming in at will. A demonstration of this feature can be viewed here. *2. WPF (Windows Presentation Foundation) The new presentation technology WPF, standard on Windows Vista, is used for the design of the Weathernews corporate website. WPF is based on the Microsoft software development platform Microsoft .NET Framework. In addition to its expressive capabilities and operability, WPF also allows users to connect to both the Internet and various services and to develop safe and superior contents and applications. Weathernews Inc. is the world's largest private weather service company. It is the only global weather contents provider that has over 600 staffs (including more than 350 meteorologists) in 31 offices in the main cities around the world. Weathernews offers a full range of weather content services based on a solid man & machine shareware system. 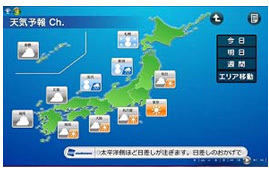 In November 2003, Weathernews became the first weather service company ever listed on the 1st Section of the Tokyo Stock Exchange (4825).